Have I mentioned big game sales do horrible things to my productivity? ‘Cause they do. Legend of Grimrock is a throwback to dungeon crawlers of old, like Eye of the Beholder and Dungeon Master. You have been arrested and thrown into the depths of the ancient prison, Mount Grimrock. Thankfully, you’re not alone, as you control a group of four prisoners, chosen from four races (human, minotaur, lizardman, insectoid) and three classes (fighter, rogue, mage). Less-than-thankfully, Grimrock wants you dead. Grimrock is easily the hardest game I’ve played in a while, and I’m taking legitimately challenging, not ‘oh you got ambushed and are now insta-dead sorry buddy’. The enemies hit reasonably hard, the puzzles are clever, and your resources are limited. Everything you find in the dungeon, from torches to alchemical ingredients to even food is incredibly scarce. Yeah, I said food. Not only do you have to keep your party alive, you also have to keep them well-fed. It adds a really nifty survival element. You think you’re reasonably safe because of all the torches and naturally regenerating health… and then you see that everyone’s about to starve to death. The game plays in real-time, meaning that you need to keep an eye on things. Spiders are particularly notorious for sneaking up on you (I’ve died so many times because of that) and, if you’re clever, you can kite poison-cloud spewing mushroom men around a room and stay out of harm’s way. Trying to brute force your way through something is a good way to waste time (and food/torches) or get yourself killed. Unfortunately, the game (to my knowledge and research) lacks permadeath, so dying is only a minor inconvenience until you find one of the healing crystals on each floor. Sometimes the puzzles are too clever. This thing, needing solved three or four times because I make bad choices, took me about an hour or so total. You can see from the screenshots that the game looks pretty great, but there’s something about it being in motion that makes it so much better. 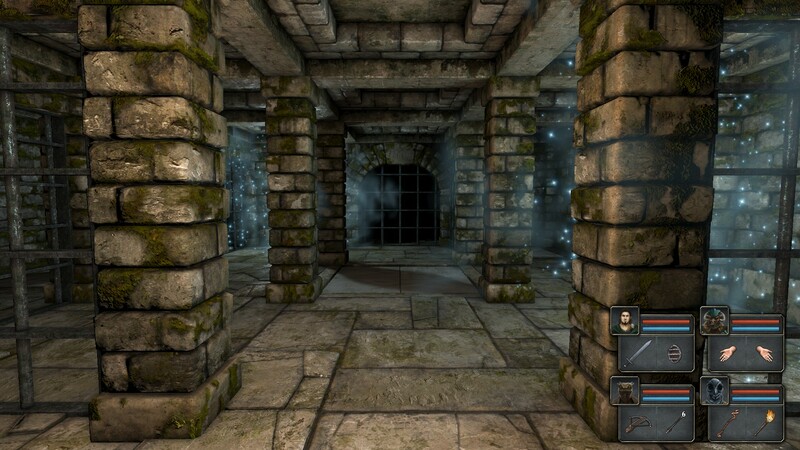 Seeing slimes pulsate and glow or spiders skitter around in the shadows gives the game a paranoid, haunting beauty. My only real problem with the game is that the controls are a bit finnicky. The game sometimes just doesn’t want to move just the right amount of spaces or turn and throw an object as quickly as you’d like. There’s also no mod support (yet), so you’ve only got Grimrock to travel through. My biggest hope for the dungeon editor is that it gets steam workshop integration for the sake of convenience. Maybe even add new, player-made races or classes, but I think the editor will add a hell of a lot of replayability. Anyway, the game’s currently six bucks on Steam, so hurry up and grab it while it’s cheap! Anyhoo, I will talk to you fine folks on Monday, so thanks for reading and have a good’un. This entry was posted in Review, Video Games and tagged grimrock dungeon editor, grimrock review, legend of grimrock, legend of grimrock review. Bookmark the permalink.